A lake which takes its name ("Gennesaret" or "Gennesar"; I Macc. xi. 67; Luke v. 1; and in Josephus) from the small fruitful plain which lies on its western side (Matt. xiv. 34; Mark vi. 53), the present Al-Ghuwair. It was also called the "Sea of Galilee" (Matt. iv. 18; Mark i. 16; comp. John vi. 1). In the Old Testament its name is "Yam Kinnereth" (or "Kinneroth"; Num. xxxiv. 11; Josh. xii. 3, xiii. 27). The lake is traversed by the Jordan, and is situated in a deep depression, its surface being 682 feet below sea-level. It is 20 kilometers long and about 9 kilometers wide, with which the statements of Josephus (140 stades long, 40 wide) nearly agree. Its greatest known depth is 141 feet. It is especially rich in edible fish. At the time of the Gospels and of Josephus it was covered with countless fishing-boats and ships, which at times were in serious danger on account of the violent winds to which the lake was subject. The surrounding mountains closely invested it, though opening in some places, in one to admit the fruitful and well-watered plain of Gennesaret, in another the plain of Baṭiḥah, on the northern side. On its western shore was the beautifully situated Tiberias, afterward a principal seat of Jewish learning. At that time there was a chain of villages and towns around the lake, though now only a few ruins are to be seen. The Biblical "Kiuneret" or "Kinnerot" is rendered in the Targumim of Pseudo-Jonathan (Num. xxiv. 11) and Jonathan (Josh. xi. 2) by "the Sea of Genusar" ("Yamma di-Genusar"). 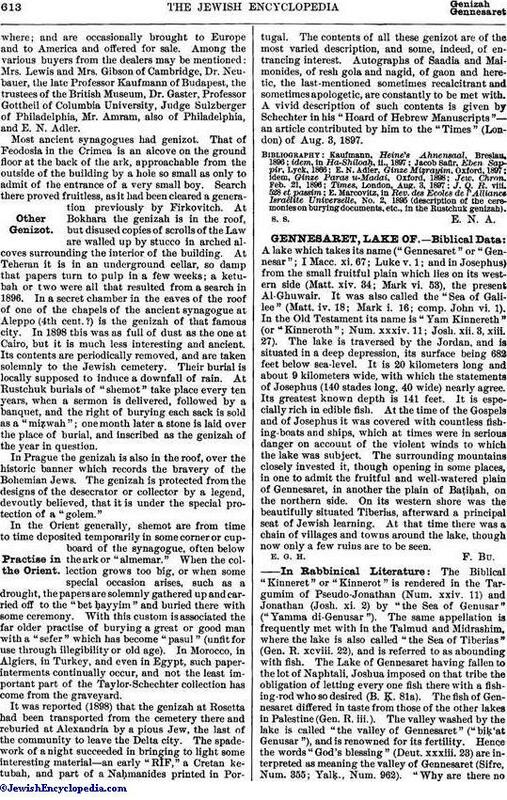 The same appellation is frequently met with in the Talmud and Midrashim, where the lake is also called "the Sea of Tiberias" (Gen. R. xcviii. 22), and is referred to as abounding with fish. The Lake of Gennesaret having fallen to the lot of Naphtali, Joshua imposed on that tribe the obligation of letting every one fish there with a fishing-rod who so desired (B. Ḳ. 81a). The fish of Gennesaret differed in taste from those of the other lakes in Palestine (Gen. R. iii.). The valley washed by the lake is called "the valley of Gennesaret" ("biḳ'at Genusar"), and is renowned for its fertility. Hence the words "God's blessing" (Deut. xxxiii. 23) are interpreted as meaning the valley of Gennesaret (Sifre, Num. 355; Yalḳ., Num. 962)., "Why are there nofruits of Genusar at Jerusalem?" asks R. Abin. "It is in order that people may not say that we go to Jerusalem only for the sake of those fruits" (Pes. 8b). The fertility of the valley is, according to the Talmudists, the origin of both the Biblical and the Talmudic names: it is called "Kinneret" because its fruit is as sweet as the sound of a harp ("kinnor"; Meg. 6a); and "Genusar" because it is "the gardens of princes" ("ganne sar"; Gen. R. xcviii. 22). Kinneret was one of the five fortified cities which fell to the lot of Naphtali (Josh. xix. 35). It is mentioned after Rakkath, which is identified in the Talmud with Tiberias (Yer. Meg. i. 1). Genusar as an inhabited place is also mentioned in Yer. Ma'as. i. 2 and in Tosef., Kelim, B. 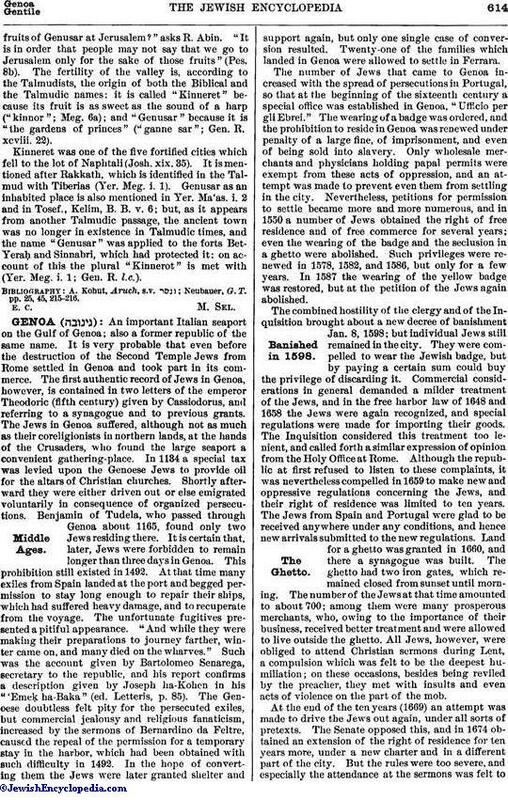 B. v. 6; but, as it appears from another Talmudic passage, the ancient town was no longer in existence in Talmudic times, and the name "Genusar" was applied to the forts BetYeraḥ and Sinnabri, which had protected it: on account of this the plural "Kinnerot" is met with (Yer. Meg. i. 1; Gen. R. l.c.). Neubauer, G. T. pp. 25, 45, 215-216.